Each spring, an owl hooting adventure takes place in April. 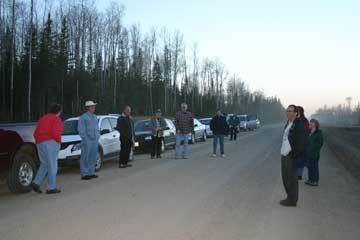 Interested participants are asked to gather at a restaurant in Candle Lake, Anglin Lake or Prince Albert National Park. Once it is dark, the group heads out in a caravan of vehicles and makes a number of stops to call and listen. If the wood frogs and chorus frogs are not croaking, owls should be heard. Nine species of owls have been recorded in the Prince Albert area. The snowy owl and the northern hawk owl are seldom heard. Most observers should be able to hear five or six owls on a good outing. DRESS WARM!